The commotion over the new Springsteen album has been brewing for several months now. I figured I'd better ride the wave and weigh in on 'Working On A Dream,' his 16th studio album and second with E Street Band in 2 years, as quickly as possible. From 'Greetings' to 'Tunnel Of Love,' I was huge fan of The Boss. (I actually saw him perform 'Stand By Me' with U2 in 1987 at JFK stadium in Philadelphia.) Then Springsteen drifted into his solo years where he became the heir apparent to Seeger and Dylan as the modern American teller of folk tales. I lost interest. With the thought of a new collaboration with E Street Band (after 2007's average, but hugely successful, 'Magic'), my interest returned. I did everything I could to avoid the presumptions and biased opinions of the past as I heard the first songs on his website. Now, with 'Working On A Dream' firmly in hand, I'm ready to return to his epic early days of my youth. Alas, in that context, 'Working On A Dream' is a disappointment. 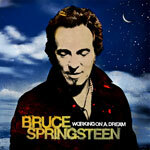 'Working On A Dream' finds Springsteen continuing his melancholy mood in both lyric and music. Honestly, except for two or three high spots, I found this work to be largely depressing and profoundly meaningless. A great percentage of the songs languish in heavy orchestration as if Springsteen was attempting to mimic Spector's wall of sound (with little success). Lyrically, I was surprised by the lack of depth from America's most celebrated poet-troubadour. The bonus track 'The Wrestler' (from the movie of the same name) is the only song that comes close to Springsteen inspiration. Actually, the most lively song on the album, 'Queen Of The Supermarket,' is intriguing simply because it's lyrics are cheesy and the music is fun. Additionally, I almost wept at not hearing 'The Big Man' Clarence Clemons presence on this disc. He's there on 'This Life,' but good luck finding him elsewhere. I'm sure I'm totally out of step and fashion here by panning Bruce Springsteen's 'Working On A Dream.' The media fascists at Rolling Stone and others are probably fawning over this work. Sorry, no matter how much I respect Bruce Springsteen, I can't be that intellectually dishonest with myself and so delude my readers. Once Springsteen and company spoke to me, the everyday, hard working, blue collar American. He was an iconoclast striking fear into the media elites and cursing music industry commercialism. Now, Bruce is mainstream: friend of the elitist media, liberal politicos, and suspiciously massaging today's commercialism. See you at the Superbowl, Bruce! Once Springsteen and company spoke to me, the everyday, hard working, blue collar American. He was an iconoclast striking fear into the media elites and cursing music industry commercialism. Now, Bruce is mainstream: friend of the elitist media, liberal politicos, and suspiciously massaging today's commercialism. See you at the Superbowl, Bruce! 'Working On A Dream' is a disappointment.